Single-family home sales on Maui rose in January, but condominium sales and overall prices began the new year on a down note. While the “market seems to be getting its footing generally,” median prices bounced along the bottom as sales dropped and inventory increased, said Terry Tolman, chief staff executive for the Realtors Association of Maui. Sales of single-family homes in January rose 48 percent to 46 units from 31 the year before, while the median price fell nearly 16 percent to $469,000 from $558,000 attained in January 2008, according to recent statistics from RAM. Condominium sales fell 34 percent to 71 units from the 108 sold in January 2008. Similarly, the price paid by more than half of the buyers dropped 47 percent to $424,000 from the year-prior $805,000 median. “Best deals are selling, everything else is getting old,” Tolman said. Single-family home sellers on average saw their properties spend 27 percent more days on the market; however, the pace of condominium sales picked up by nearly 79 percent. On average it took 224 days to sell a single-family home and 240 days to sell a condominium. “Days on the market figures show that properties that are priced right will sell in a reasonable time frame,” Tolman said. Short sales and bank-owned properties will have to be absorbed by buyers before Maui’s market returns to normal and prices can start to rise, he said. But, that could take a while, said Howard Dinits, a Realtor at Waimea-based RE/MAX Resort Realty. 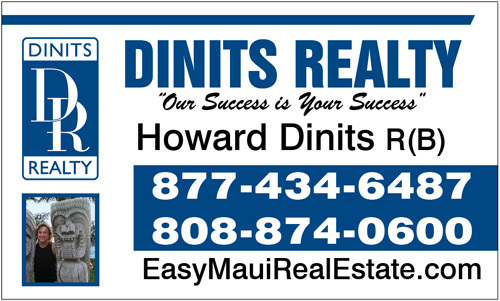 Dinits said he is basing his opinion not only on the timing of the last real estate boom on Maui, but on government indicators.